Forced sterilization is the involuntary or coerced removal of a person’s ability to reproduce, often through a surgical procedure referred to as a tubal ligation. Forced sterilization is a human rights violation and can constitute an act of genocide, gender-based violence, discrimination, and torture. For an overview of forced sterilization around the world, see Eliminating Forced, Coercive and Otherwise Involuntary Sterilization: An Interagency Statement (2014), a report produced by several intergovernmental bodies. When performed without informed consent, sterilization violates an individual’s rights to dignity, humane treatment, health, family, information, privacy, and to freely decide the number and spacing of children, among other rights. 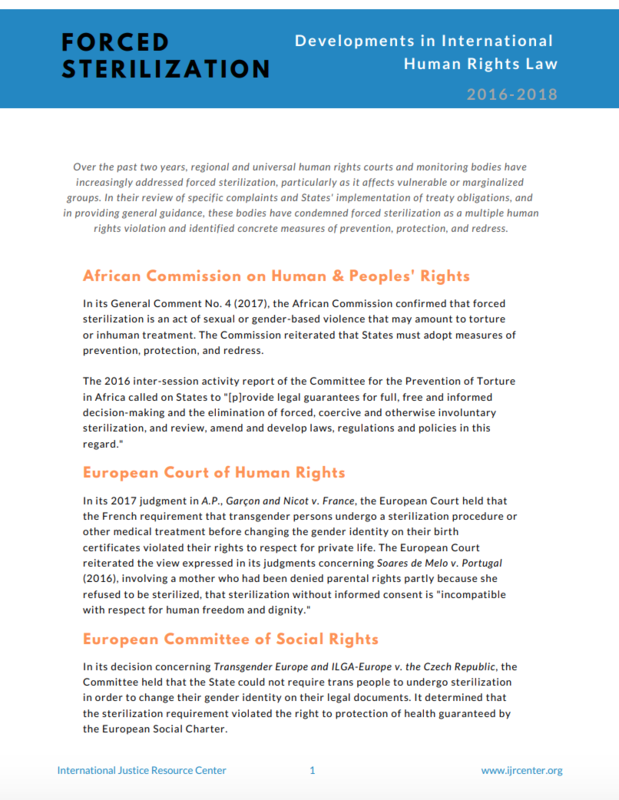 In recent years, human rights bodies have further clarified the steps States must take to prevent forced sterilization, protect survivors, and ensure access to redress. See our four-page summary of recent developments in international human rights law on forced sterilization for details. The International Justice Resource Center’s work on forced sterilization began with our joint amicus curiae brief in the case of I.V. v. Bolivia before the Inter-American Court of Human Rights. We urged the Court to view forced sterilization as a multiple rights violation, to hold that it violates the human right to dignity, and to include mandatory training for health care professionals among its ordered reparations in that case. Learn more about that judgment in IJRC’s news post. More recently, we have partnered with advocates in other countries to support and guide their efforts to seek redress for victims and to put a stop to forced sterilization. For example, we are working closely with attorneys in Canada who represent forcibly sterilized Indigenous women, guiding and assisting them in bringing their allegations and advocacy to the international level. Read more about those efforts and their impact on our webpage. 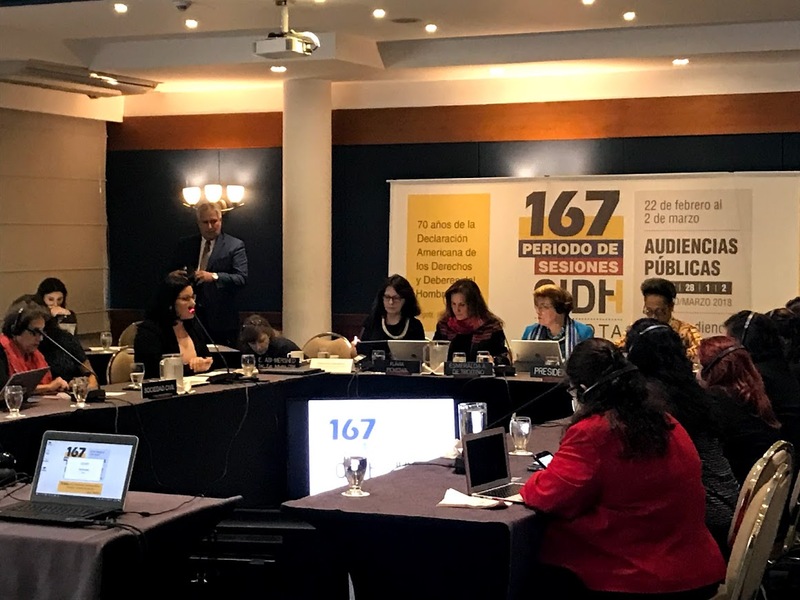 For example, IJRC participated in the 63rd United Nations Commission on the Status of Women (CSW) in March 2019 to further raise awareness of forced sterilization. In furtherance of our partners’ advocacy, we urged CSW participants to discuss and address forced sterilization as an obstacle to the empowerment and equality of women and girls. The issues and our recommendations are summarized in a one-page factsheet. IJRC also organized a parallel event on preventing and redressing forced sterilization, which included views from advocates in Canada and Kenya. See the event flier for details.